After his victory at Crécy (26 August 1346), Edward III of England patiently laid siege to the city of Calais so as to starve the population into submission. The city surrendered on 4 August 1347. 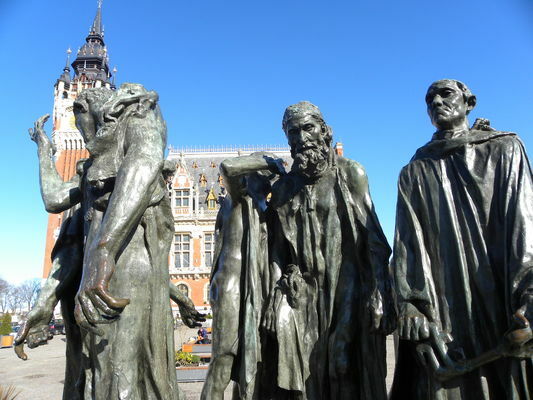 Eustache de Saint-Pierre, Pierre and Jacques de Wissant, Jean d’Aire, Jean de Fiennes and Andrieus d’Andres then sacrificed themselves to save the survivors. Queen Philippa of Hainault persuaded the King to spare their lives. However, the inhabitants were expelled from the city, which would remain English until it was recaptured by François de Guise in 1558. Rodin, whose project had been selected to create a monument that would represent the Burghers of Calais, presented his work at an exhibition in the spring of 1889. The site chosen at the time, a platform situated at the entrance of the "Front-Sud" garden, is currently taken up by the memorial to the dead located in front of Parc Richelieu. During the First World War the sculptures were stored in the cellars of the then under-construction city hall. In November 1919 they were placed on a new site at Place d’Armes. 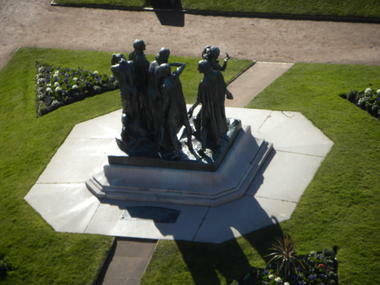 On 20 March 1920 Rodin’s monument was put back on its original pedestal at Place Richelieu, in front of the park. In June of 1924 it went back to Place d’Armes so that the site became available for the recently completed memorial to the dead of World War I.
measure, it was loaded onto a lorry destined for Coupvray in the Seine-et-Marne department on 18 January 1943. When the lorry reached Boulogne-sur-Mer, it could not pass through a gateway because it was too high, and the precious load returned to Calais. Loaded onto a flat wagon, the monument went back into exile on 29 January. 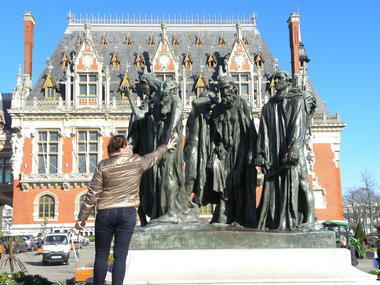 bronze figures is one of the best-known sculptures by Auguste Rodin. 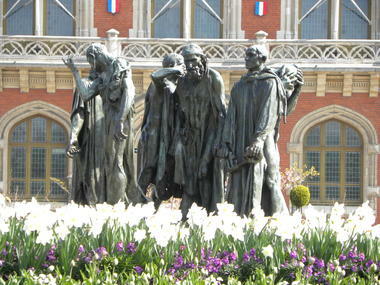 While the first cast of Rodin's The Burghers of Calais still stands at Calais, eleven other original casts of the famous statue are currently on display at Ny Carlsberg Glyptotek in Copenhagen (Denmark), the Royal Museum in Mariemont (Belgium), Victoria Tower Gardens in London (United Kingdom), the Rodin Museum in Philadelphia (United States), the Musée Rodin in Paris (France), the Kunstmuseum in Basel (Switzerland), the Hirshhorn Museum and Sculpture Garden in Washington D.C. (United States), the National Museum of Western Art in Tokyo (Japan), the Norton Simon Museum in Pasadena (United States), the Metropolitan Museum of Art in New York City (United States), and the Samsung Foundation for Art and Culture in Seoul (South Korea). There is no review about La Statue Des Six Bourgeois De Calais, be the first to leave one !